I've recently looked at your site having just returned from a stint in the hospital. I was feeling really low, and fed up with being housebound and went to Music Mosaic to check out new releases. I haven't stopped listening to the new albums and I've finally got a copy of Didgeridoo Rocks as well as a couple of other albums lined up for downloading. You've really cheered me up, and although it hurts to boogie, I'm bopping in my bed to all the wonderful and funky sounds with a big cheesy grin on my face. I can't believe I am the only person to have downloaded Didgeridoo Rocks btw. I love the way we can choose to pay a set price for an album or donate what we believe the creativity is worth - an inspired idea. Keep the mixes flowing and thank you from me and my partner for the groovy times your music gives to us. Thanks again for persuading the artist's to allow us to download their wonderful contributions. Being the other side of the world it makes it easier for me to shop, and I can enjoy it anywhere on my mp3 player, not just at home on a CD. Here's to me bopping on my feet again soon. Deep enigmatic tones blend with punchy percussion, haunting horns, smooth melodies and animal calls that stir the soul and move our feet to the wild mysteries of timeless Spirits. 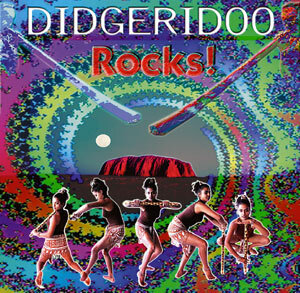 Didgeridoo Rocks! Click Buy (above) to download the album or any track(s) in 320k MP3, FLAC, or just about any other format you could possibly desire. Dr Didge & Ray Brown: didgeridoo - Birds: calls and chirps!